February 16, 2014 — NASCAR NewsWire — Getty Images for NASCAR photo — NEW SMYRNA, Fla. — Offseason did nothing to slow Daniel Suarez’s momentum. 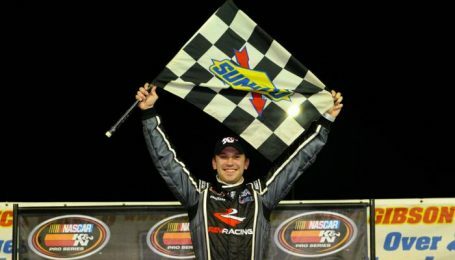 The Monterrey, Mexico, driver held off Cameron Hayley in a door-to-door battle of NASCAR’s rising stars to win the New Smyrna 150 presented by JEGS Saturday night at New Smyrna Speedway. The race was the NASCAR K&N Pro Series East season opener and the inaugural visit to the banked half-mile. Driving for Rev Racing and NASCAR’s Drive for Diversity, the 22-year-old Suarez picked up his second career victory and gave Rev Racing its 13th win since 2010. It marked Suarez’s sixth top-three finishes in eight NASCAR K&N Pro Series East races dating back to last year. And it was his second straight NASCAR touring series win; Suarez won the NASCAR Toyota Mexico Series finale at Mexico City in November. Suarex is also a member of the NASCAR Next program that spotlights young, talented drivers. Hayley, 17, won the 21 Means 21 Pole Award presented by Coors Brewing Company earlier in the day. But it was Suarez and Brandon Jones, 16, who led the way for most of the night. Jones led 34 laps before giving way to Suarez on Lap 48 and eventually finishing third. Ben Rhodes and Lee Pulliam rounded out the top five. It was the series’ debut for Pulliam, the two-time defending NASCAR Whelen All-American Series champion. A late race caution set the stage for tense closing laps. Pulliam restarted alongside Suarez, slipped up and dropped out of the top five. That allowed Suarez to get away and Hayley to move back into second. With four to go, Hayley muscled his way alongside Suarez. They rubbed and stayed side-by-side, with Suarez leading leading by inches to the white flag and beating Hayley to the finish by .083 seconds.